Like buying a home or starting a family, weddings are a major life event that many couples are willing to pay top-dollar to experience. A recent survey conducted by The Knot found the average cost of a wedding, not including the honeymoon, reached a whopping $29,858 in 2013. You definitely don't have to shell out close to $30,000 in order to enjoy your special day — but no matter how much you want to spend, there are more costs associated with getting hitched than you might anticipate. Whether you're planning an intimate gathering or a mega-wedding of Kimye proportions, you can make your dream wedding happen by planning ahead and earning 1.5% cash back on all your purchases with Capital One's Quicksilver card. The Knot found spending on weddings reached an all-time high last year, which means if you're anything like the average newlywed, the rings, dress, and cake only account for a small piece of your overall wedding day budget. Many of these costs are optional and you can skimp in one area to splurge on another, such as opting for a DJ instead of a band. However, there are some expenses you probably can't avoid. 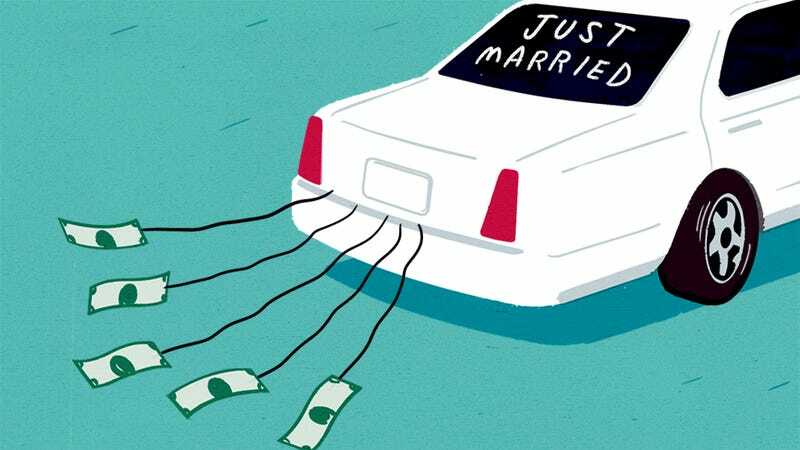 Limo and DJ aside, here's a closer look at some of the major financial considerations you should think about before getting married. Financial Attorney and Debt Specialist, Leslie Tayne, Esq. of Tayne Law Group, P.C., notes that the engagement ring is one of the biggest and most important expenses to weigh carefully. "Diamond rings are very costly and while it is an investment, it is one you should consider," she says. "Remember, if you are going to have a short engagement, you will need to plan soon for wedding expenses that you may want to consider when determining a budget for buying the ring." Tayne also suggested looking into insurance for the ring since it is such a high-value purchase and can be easily lost, stolen, or damaged. Ultimately, it's up to you to decide what your wedding ceremony and reception will involve. In fact, in a study by Lexington Law, 36 percent of Americans said they would budget less than $5,000 for their dream wedding. Only 5 percent said they would spend more than $30,000. However, Tayne pointed out that the actual wedding date can also affect the overall cost. "Depending on month, season and time of day, costs may be cheaper, resulting in greater savings." Additionally, you should ensure you have a weather clause in your agreement with your caterer to avoid risk of being out of money should there be any kind of weather-related issue affecting your wedding day. Elle Kaplan, CEO and Founding Partner of LexION Capital Management, explains that it's important to view your newly combined finances as a long-term commitment as well, and to take time to ensure you're both on the same page about how your mutual money will be managed. "Before you walk down the aisle, start an open, honest dialog about your finances, including debt, attitudes towards money, spending habits, and long term goals. But this doesn't have to happen overnight. Just as you took your time to get to know each other while you were dating, newlyweds can get to know each other financially one step at a time," she said. And just because some people choose to go all out on their weddings doesn't mean you have to sacrifice your financial future to keep up. "Consider your specific circumstances. Just because your dream wedding costs $30,000 doesn't mean you have that kind of money. A wedding is what you make it," says Dennis M. Breier, president of Fairwater Wealth Management. Obviously, even a basic wedding budget is nothing to sneeze at. So how can you ensure you have all the essentials covered with enough left over to splurge a little? While couples shouldn't bank on receiving a ton of money from guests (after all, simply attending a wedding is wildly expensive), they can forgo the wedding registry and ask for cash gifts instead. "With registries, young couples might be tempted to register for luxury items they won't often use and wouldn't ordinarily buy," explained Kaplan. "Starting a new life together without a heaping pile of wedding debt is much better than that espresso machine you might never use." If you have some time before the actual event, consider opening an account specifically for this savings goal. "Set your wedding budget as a percentage of your savings. Many couples simply spend everything they have on a wedding because it is a once in a lifetime event. This is true, but it is important that you consider your financial well-being after the day is complete," recommends Breier. For all the extra costs that fall outside of your savings, be strategic about using credit. Rather than charging your wedding expenses to a traditional credit card, look for a rewards card — like the Quicksilver card by Capital One — which lets you earn 1.5% cash back on every single purchase. If you're going to spend the money, why not get paid to do it? Capital One's Quicksilver card offers 1.5% cash back on all purchases with no cap. Plus, there's no annual fee. You can literally get paid to shop: a winning #KaCHING moment in the life of any parent. Purchase APR: [13.9% variable.] Cash Advance APR: [24.9%] variable. All APRs in effect as of [10/31/2010]. Cash Advance Fee: greater of [3%] or $. Annual Fee: [$59 after the first year]. Minimum Finance Charge: [$0.50]. This post is a sponsored collaboration between Capital One and Studio@Gawker.